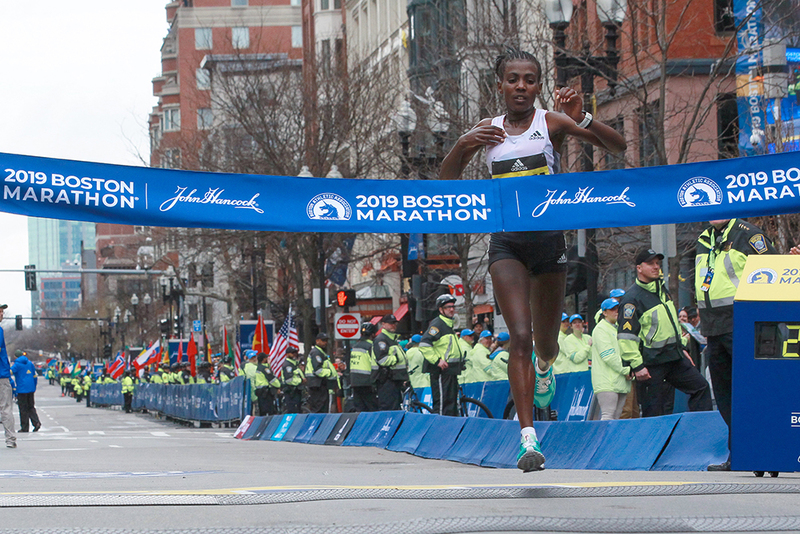 BOSTON, MASSACHUSSETTS, April 15—Worknesh Degefa ran fearlessly to one of the most dominating women’s victories in the history of the Boston Marathon. The 28-year-old Ethiopian broke from the pack in mile No. 5 and simply ran away from the field, extending her lead to more than a half-mile and breaking the tape in 2:23:31. In the wake of Degefa’s solo dash for the laurel wreath, Kenyan veteran Edna Kiplagat (2:24:13) mounted a late charge to prevail in a spirited 9-woman tussle for 2nd. Jordan Hasay continued her impressive return to racing after a year-long injury hiatus to take 3rd in 2:25:20 in her first 26-miler since Chicago ’17. Defending champ Desiree Linden finished 5th in 2:27:00, and Lindsay Flanagan ran 2:30:07 good for 9th and the Olympic qualifier that goes with a top-10 finish in a World Marathon Majors competition. With forecasts similar to last year’s heavy rain and headwinds, the runners caught a break as early morning downpours cleared out before the gun. 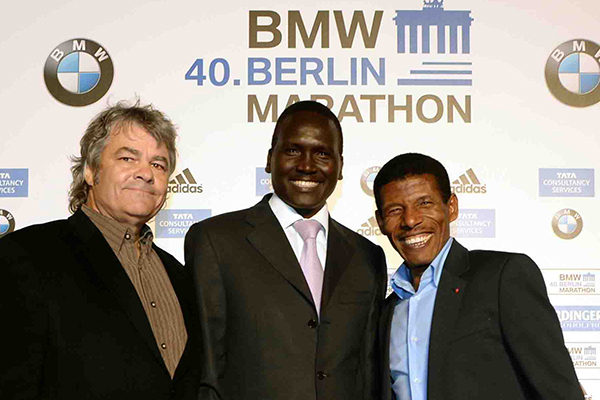 “I’m happy the race took place after the rain was done,” Degefa offered, echoing the sentiments of all of the runners who had prepared for the worst. All three of Degefa’s previous marathons were on Dubai’s pancake-flat course, and she had been appropriately cautioned about Boston’s 200ft plunge over the opening 4M and was content to follow Sara Hall’s lead. 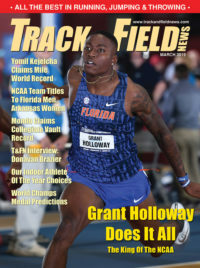 When the terrain flattened out in the fourth mile Degefa felt ready to resume proper running, explaining, “I knew I had some speed so I pushed myself after 5M.” Locking into 5:12–5:18 pace she extended her lead with each stride. By 9M her margin bettered a minute, and she crossed halfway in 70:40, a whopping 2:28 ahead of the chase pack. As Degefa literally ran out of sight there was no denying the challenge that she handed her competitors and TV producers. Perhaps both should have expected this of the Ethiopian recordholder. Degefa has been exclusively a road racer, first focusing on the half-marathon, dropping her PR to 67:49 in ’13 and 66:14 in ’16. A year later she made a successful marathon debut, winning Dubai in 2:22:36. She returned to Dubai in ’18, finishing 4th but ducking under 2:20 by 7 seconds. This year began with another trip to Dubai where she followed Ruth Chepngetich’s stunning 2:17:08 with an equally stunning 2:17:41, paring 15 seconds off Tirunesh Dibaba’s NR. The American duo rejoined the 10-woman chase pack and passed halfway in 73:08. Kiplagat leaned into the Newton Hills, whittling the chase pack to seven at 30K with Hasay matching the effort, but Linden slipped 40m back. Kiplagat soon broke clear of the chase pack and cresting Heartbreak managed some hope of catching Degefa, who extended her lead to more than 3:00 through the hills and had a 2:56 lead at 35K. “After I broke away from the group I decided to make a second strong move to reduce the gap,” Kiplagat said of the late-race surge that cut her deficit to 68 seconds at 40K. Degefa eased back to 5:30 pace but didn’t falter and Kiplagat realized, “The gap was too big and I was not going to make it. But it was good for me as I was able to be 2nd.” The 39-year-old 2-time world champ now sets her sights on her fifth WC competition in Doha. 24. Sarah Pease (rabb) 2:39:08; 25. Kimi Reed (Sauc) 2:40:12; 26. Dawn Grunnagle (Nik) 2:40:26; 27. Caitlin Chrisman (Strava) 2:40:29; 28. Nami Hashimoto’ (Jpn) 2:40:41; 29. Dot McMahan (Mi) 2:40:45; 30. Michele Lee (Mi) 2:41:02; 31. Paula Pridgen (NC) 2:41:36;… 33. Amanda Nurse (Ma) 2:42:30;… 35. Rachel Hyland (Ca) 2:42:41; 36. Ladia Alberston-Junkans (Wa) 2:43:04;… dnf—Mare Dibaba’ (Eth), Sally Kipyego’ (Ken).